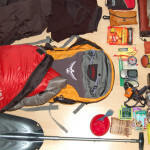 Personal equipment required for mountain walks and camps, taking into account various weather conditions. Additional equipment required by a leader. Design and construction of equipment, including its material characteristics, care and maintenance. Packing and carrying personal and group kit. Selection and safe use of camping stoves and fuel.